CHECK OUT THE NEW SLIDE SHOW OF OUR 40TH REUNION PROVIDED BY JOHN WEDDING. Gerstmeyer Technical High School was created from two vocational high schools in Terre Haute. 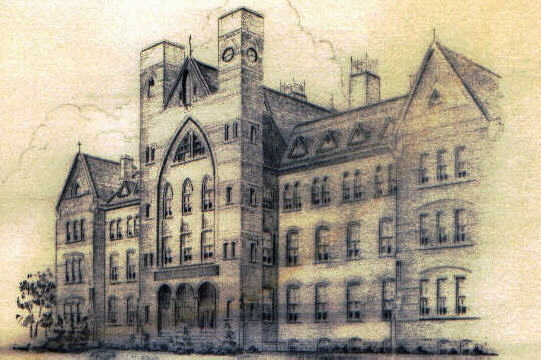 The first was a boys' school established in 1915 at Lafayette and Third Avenue; the second was a girls' vocational school established in 1916 at 6 1/2 and Poplar streets. When the Terre Haute Board of School Trustees purchased the building occupied by the Rose Polytechnic Engineering School at 13th and Locust, the Boys' Vocational School was moved to this location in 1922 and renamed Gerstmeyer Vocational High School. In January 1925, the Girls' Vocational School was also moved to this site and the school name changed to Gerstmeyer Technical High School. By September 1925, Gerstmeyer had become a first class commissioned high school. A full program of high school courses was added to the vocational curriculum and a four-year graduate program was developed. The first school yearbook, The Scarabaeus, was produced in 1930; in 1962, the name of the yearbook changed to The Scroll. The school newspaper was first published in 1922 as The Anvil. Gerstmeyer closed in 1971 and consolidated with Garfield into North Vigo High School.